There are over 2 million street dogs that roam the streets of Romania. Many fall victim to starvation and freezing temperatures. Those that are unaltered give birth to many offspring, only to have them suffer the same fate. 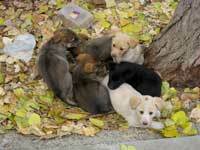 Romania Animal Rescue, Inc. has a mission to help fix this dilemma. By providing free spay and neuters to dogs and cats, both homeless and owned throughout Romania, they are lessening the number of suffering animals. CNF has awarded Romania Animal Rescue, Inc. with a Spring 2013 Grant for spay and neuter of approximately 100 animals throughout Romania. That is 100 less suffering souls, and countless offspring to have to face the challenges of traffic, abuse, starvation and freezing temperatures. RAR, Inc. educates the public, teaches local Veterinarians about modern surgical techniques and provides veterinary care to countless animals.